Product prices and availability are accurate as of 2019-04-20 00:51:55 EDT and are subject to change. Any price and availability information displayed on http://www.amazon.com/ at the time of purchase will apply to the purchase of this product. The UX-CC500 offers a unique way to integrate all your business communications. 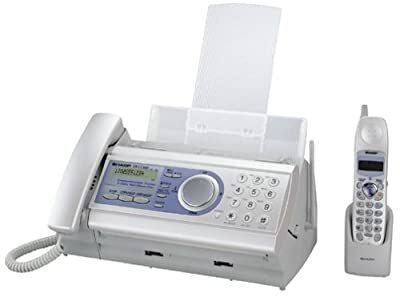 This plain-paper thermal fax unit with copying functions offers the added benefit of an integrated 2.4 GHz cordless phone system that is expandable to up to four handsets. Individual handsets house all the basic features you would expect--caller ID, headset compatibility, and speed-dial--and are able to function as portable intercoms within the office. The phone system itself supports a fully integrated digital answering system with up to four individual mailboxes and 20 minutes of message recording time. The center's base unit is home to a corded phone, along with the UX-CC500's fax and copy functions. Handling up to 50 sheets of letter or legal paper in it's standard tray, this communications center also features a 10-sheet auto-document feeder and a 448 KB memory for storing up to 24 pages of incoming or outgoing documents.